Four years ago, in the shadow of Colorado’s Pike’s Peak, veteran Woodland Park High School chemistry teachers Jonathan Bergmann and Aaron Sams stumbled onto an idea. Struggling to find the time to reteach lessons for absent students, they plunked down $50, bought software that allowed them to record and annotate lessons, and posted them online. Absent students appreciated the opportunity to see what they missed. But, surprisingly, so did students who hadn’t missed class. They, too, used the online material, mostly to review and reinforce classroom lessons. And, soon, Bergmann and Sams realized they had the opportunity to radically rethink how they used class time. 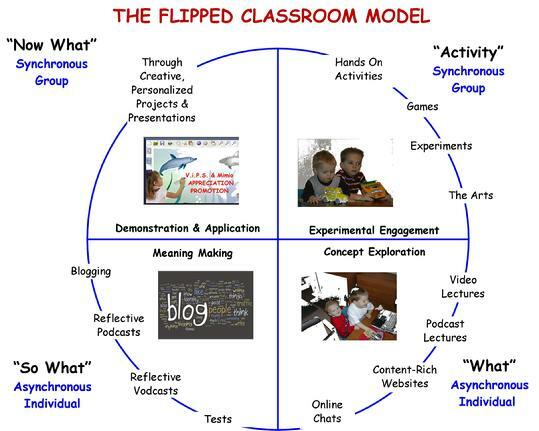 It’s called “the flipped classroom.” While there is no one model, the core idea is to flip the common instructional approach: With teacher-created videos and interactive lessons, instruction that used to occur in class is now accessed at home, in advance of class. Class becomes the place to work through problems, advance concepts, and engage in collaborative learning. Most importantly, all aspects of instruction can be rethought to best maximize the scarcest learning resource—time. Flipped classroom teachers almost universally agree that it’s not the instructional videos on their own, but how they are integrated into an overall approach, that makes the difference. After flipping his classroom, Bergmann says he can more easily query individual students, probe for misconceptions around scientific concepts, and clear up incorrect notions. Counter intuitively, Bergmann says the most important benefits of the video lessons are profoundly human: “I now have time to work individually with students. I talk to every student in every classroom every day.” Traditional classroom interactions are also flipped. Typically, the most outgoing and engaged students ask questions, while struggling students may act out. Bergmann notes that he now spends more time with struggling students, who no longer give up on homework, but work through challenging problems in class. Advanced students have more freedom to learn independently.